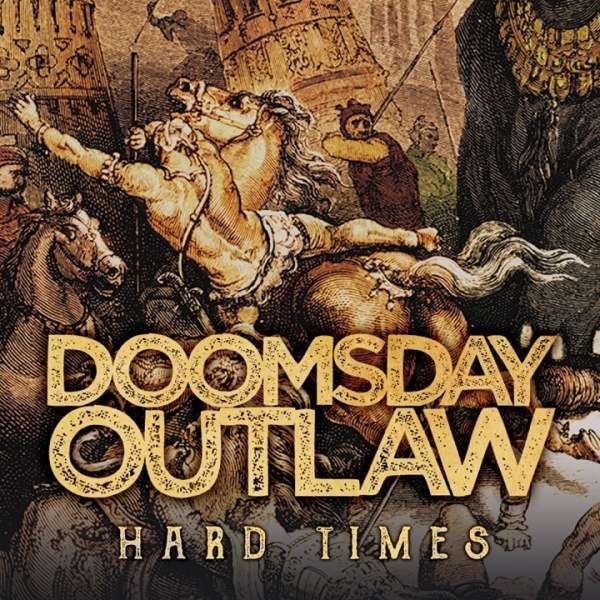 Der Artikel Doomsday Outlaw: Hard Times wurde in den Warenkorb gelegt. DOOMSDAY OUTLAW is a ten-legged hard rock, blues tinged juggernaut based in darkest Derbyshire. Coupling huge riffs and killer grooves with soaring, soulful vocals to deliver timeless tales of heartbreak and redemption, the group is set to show off its distinctive sound to the legions of hard rock faithful around the globe via a new album, ›Hard Times‹, which is set for worldwide release via Frontiers Music Srl in May 2018. Doomsday Outlaw vocalist Phil Poole says: »Not wanting to sound clichéd, but we're so excited to be sharing our new album with the world. We've given everything to create something we are really proud of and having the opportunity to share it is really what's it's all about. Whether you buy the record, just listen to it, or come and see us live, getting feedback from fans is amazing and is a feeling that never gets old. This is a big year for us and we can't wait to get cracking.« Drummer John Willis adds: »Phil is our ace in the hole. Everything else was in place with the songwriting and performance, but Phil has helped take the band to the next level.« Poole joined the already well-oiled quartet of Steve Broughton and Gavin Mills (guitars), John ›Ironfoot‹ Willis (drums) and Indy (bass) in June 2015, after which the band really gelled as a cohesive unit. Wasting no time in crafting a killer new set, they subsequently hit the road and have shared stages with the likes of Stone Broken, Warrior Soul, Vintage Caravan and Electric Boys. Self-released in May 2016, the band's debut album, ›Suffer More‹, received glowing notices from UK magazines such as Powerplay (»I doubt you will hear a better album this year. 10 out of 10«) and Fireworks (»Now THIS is a find!«), an ›Album of the Week‹ accolade from website Worship Metal (»Doomsday Outlaw could release an album every 6 weeks and it'd be better than 99% of the bands out there«) and many more rave reviews. Mounting critical acclaim plus a burgeoning reputation as a killerlive act brought the band to the attention of Frontiers Music Srl, a company that is already home to rising UK stars such as Inglorious, Wayward Sons and Bigfoot, in addition to hard rock legends like Whitesnake and Uriah Heep. Realizing their enormous potential, label president Serafino Perugino wasted no time in signing the band. With their new album and a ton of live shows locked in, including a string of summer festival appearances, 2018 is destined to be the Year of the Outlaw!